We see lot of electronic conference badges, and they always manage to display functional electronics in a fun way. Some double as handheld video game consoles, while others act as portable hacking stations. Badges are a way for hackers and makers to express their creativity, and their are limitless examples of eye-catching designs. The Ph0xx ESP32 badge is one of them, and it can even be turned into a walking bipedal robot. The Ph0xx badge was created by Wim Van Gool for Fri3d Camp, a family-oriented hacker event in Belgium. Fri3d Camp received 600 attendees in mid-August, and every single one of them got their own Ph0xx badge. That meant the build cost needed to be low, but that doesn’t mean they skimped on quality. 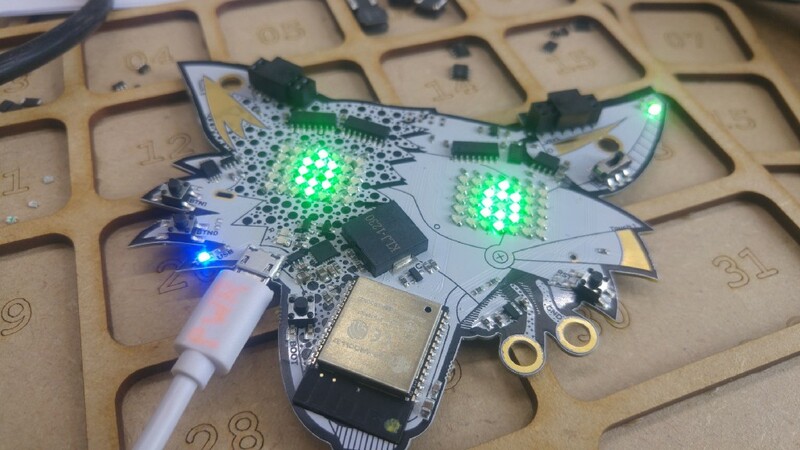 The first thing you notice about the Ph0xx badge is the custom PCB made to look like a fox head. But, this isn’t just an aesthetic badge with blinking lights. It’s powered by an ESP32 module, and Espressif was even kind enough to donate 700 of them to make the Ph0xx badges. There are two 5×7 LED arrays, an accelerometer, a 18650 battery and charger, buttons, a buzzer, and expansion headers. Those headers can be used with the Air jewel, which adds a dust particle sensor and GPS for environmental monitoring. They can also be used with the Bot jewel to build a bipedal robot with four servos that it can use to walk around. Unless you attended Fri3d Camp, you won’t be able to get an assembled Ph0xx badge, but the design files are available on GitHub if you want to build your own. Ph0xx Is an ESP32 Badge That Can Be Turned into a Robot was originally published in Hackster Blog on Medium, where people are continuing the conversation by highlighting and responding to this story.